This the season for celebration! Included in our celebration is our individual traditions and all our favorite songs! ‘O Christmas Tree! Recently, the Rockefeller Center in New York City celebrated the lighting of a very large tree – a long standing tradition. The official website of the Rockefeller Center Christmas tree claims the tree is a ‘world – wide symbol of Christmas.’ A pagan symbol I realize, however, a symbol of hope and the season of joy. And I have always loved decorating a tree each year. The first Rockefeller tree has quite a story. The tradition started with construction workers. They were the first men to put a tree up in Rockefeller Center. It was intended as a depression era pick me up. 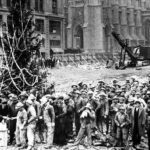 The story goes that on Christmas eve, 1931, construction workers at the Rockefeller Center site decided to pool their money and purchased the first twenty foot balsam tree. They freely decorated the tree with hand crafted garland and other decorations from their families. Then, they then lined up at the tree to receive their paychecks. Thus, was born a tradition. Very thankful men in very difficult times. During WWII, the tree was decorated in a patriotic theme – red, white, and blue globes with painted wooden stars. In 1942, no materials needed for the war were permitted to be used for the tree, so three smaller trees were decorated – each in one of the flag’s three colors. In 1944, the tree was unlit due to black out regulations during the war. In 1945, the dark year was soon forgotten as six ultraviolet light projections were added to make the 700 fluorescent globes appear to be glowing the dark! By the 1950’s it took twenty workers on scaffolding nine days to decorate the tree. A tradition continued. Now, trees are found in Ohio, Connecticut, Pennsylvania, Vermont, and even Canada and are usually Norway Spruce. This year, a 94 foot tree was chosen from New York. After the holidays, the tree with be used to make homes for Habitat for Humanity. Over 100 million people with see the tree and be reminded ‘O Christmas Tree, How lovely are your branches. It is my sincere hope as we decorate for the season that we have fun with all our traditions, enjoy friends and family, and never forget the Reason we celebrate!